Focus Marketing saw an opportunity in door-to-door sales (the “Unwanted Child of Sales”) from the founder’s experience working for Prime Energy, whose owner is now a co-shareholder. Focus supplies door-to-door sales staff for mainly energy clients who are seeking customers to switch from other suppliers. Last year, the company handled 18,000 customer “turns” in an industry where the monthly churn rate is quite high. The company’s growth is continuing, with an office just opened in Christchurch and one planned for Hamilton. The Judges liked the focus, capability and ambition of this company. 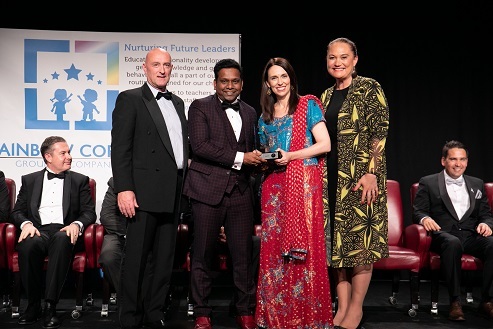 Focus Marketing Limited won the ‘Best Large Business Award.’ Its Director Kiran Arul is seen here with (from left) Ronnie Ronalde, Group Operations Manager, Charles Pandey Group of Hotels, Jacinda Ardern and Carmel Sepuloni. Focus Marketing saw an opportunity in door-to-door sales (the “Unwanted Child of Sales”) with Guidance and mentorship of Yogesh Chand (GM Pulse Energy) and Michael Skates (Director, Prime Energy), Focus has transformed into a high performing Outsourcing company.